Moving to protect the US from advanced missile threats from China and Russia, President Donald Trump on Thursday laid out plans for a new array of space-based sensors and other high-tech systems designed to more quickly detect and defeat attacks. Trump, in a speech at the Pentagon, declared that space is the new warfighting domain. And he vowed that the US will develop an unrivaled missile defense system to protect against advanced hypersonic and cruise missile threats from competitors and adversaries. "Our goal is simple: to ensure that we can detect and destroy any missile launched against the United States _ anywhere, anytime, anyplace," Trump said. "In a time of rapidly evolving threats, we must be certain that our defensive capabilities are unrivaled and unmatched anywhere in the world." Trump did not mention Russia, China or North Korea in his roughly 20-minute speech. But the Pentagon's new strategy makes clear that its plan for a more aggressive space-based missile defense system is aimed at protecting against existing threats from North Korea and Iran and countering advanced weapon systems being developed by Russia and China. The new review is the first since 2010, and it concludes that to adequately protect America, the Pentagon must expand defense technologies in space and use those systems to more quickly detect, track and ultimately defeat incoming missiles. Acting Defense Secretary Pat Shanahan, who also spoke, said the new hypersonic missiles being developed by nations such as Russia and China are harder to see, harder to track and harder to defeat. To address that, the US is looking at putting a layer of sensors in space to more quickly detect enemy missiles when they are launched. The US sees space as a critical area for advanced, next-generation capabilities to stay ahead of the threats. The administration also plans to study the idea of basing interceptors in space, so the US can strike incoming enemy missiles during the first minutes of flight when the booster engines are still burning. Russia and China have made clear their efforts to develop the high-tech programs. Russian President Vladimir Putin unveiled new strategic weapons he claims can't be intercepted. One is a hypersonic glide vehicle, which could fly 20 times faster than the speed of sound and make sharp maneuvers to avoid being detected by missile defense systems. Missile defense officials on Thursday declined to provide any budget estimates or timelines for the programs. Michael Griffin, the defense undersecretary for research and engineering, told Pentagon reporters that developing a new layered network of sensors in space is key to being able to detect a fast-moving hypersonic missile in its early, more vulnerable stages. The Pentagon, he said, will study the issue to determine how many would be needed, and at what orbit they would fly. He said the program is affordable and some funding for that would be in the budget that will be proposed for 2020. The system could be operational in the late 2020s. Officials said the study on space-based interceptors could begin in the coming months. But, recognizing the potential concerns surrounding any perceived weaponization of space, officials emphasized that no testing is mandated, and no final decisions have been made. Sen. Edward Markey, D-Mass., a member of the Foreign Relations Committee, immediately raised concerns, calling the plan a bad Star Wars sequel. "While it is true that the missile threat environment America now faces is different, the answer is not to build a wall in space," Markey said. Adding that Trump's "misguided rush to weaponize space would be as ineffective, costly, and dangerous as it was more than three decades ago when it was soundly rejected." 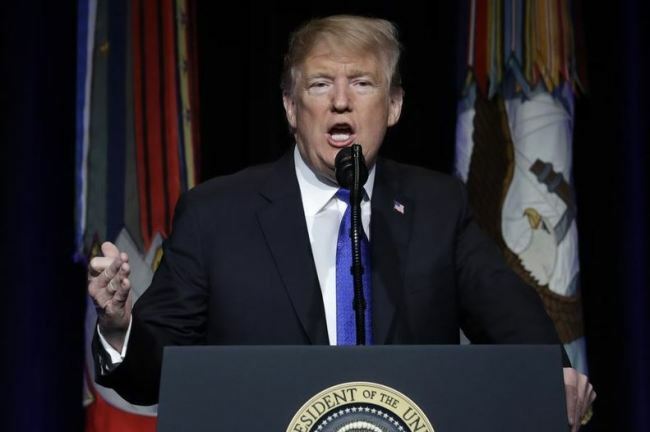 During his Pentagon appearance, Trump also pressed his case to build a wall on the southern border and expressed his condolences on the deaths of four Americans in Syria on Wednesday. Any expansion of the scope and cost of missile defenses would compete with other defense priorities, including the billions of extra dollars the Trump administration has committed to spending on a new generation of nuclear weapons. An expansion also would have important implications for American diplomacy, given long-standing Russian hostility to even the most rudimentary US missile defenses and China's worry that longer-range US missile defenses in Asia could undermine Chinese national security.